Edition: From an incomplete set of 18 of these illustrations at the Davison Art Center, which holds plates 1–5, 7–10, 12–19, and 22. Bibliography: See Alain Merot, “Eustache le Sueur et ses Graveurs: Un Ensemble Incomplet,” Nouvelles de l’Estampe, ca. 1982. 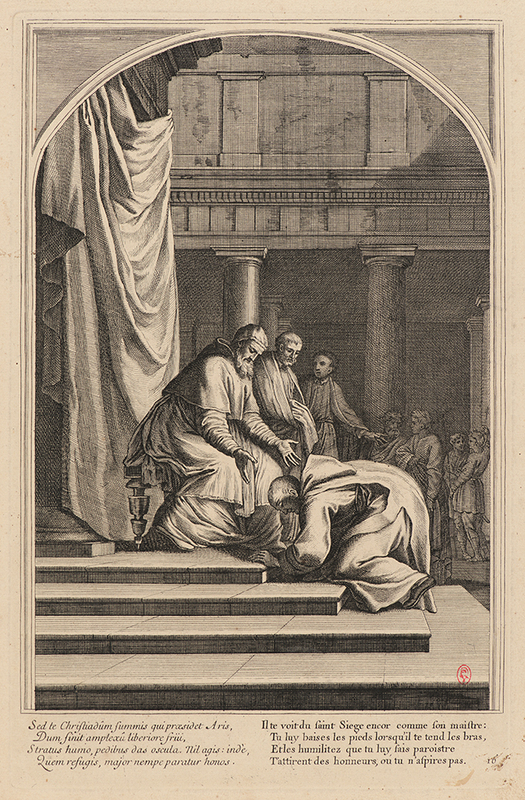 The Life of Saint Bruno, or The Founding of the Carthusian Order, Plate 16, . From The Life of Saint Bruno, or The Founding of the Carthusian Order. Engraving on laid paper. Plate: 338 x 220 mm (13.3 x 8.7 in.). DAC accession number 1982.46.1.14. Gift of Brian Douglas Gracie (B.A. Wesleyan 1969), 1982. Open Access Image from the Davison Art Center, Wesleyan University (photo: M. Johnston). http://dac-collection.wesleyan.edu/obj692 is a persistent link to this page with no user-session information.